This soft handpainted silk scarf is perfect for the car enthusiast, man or women. 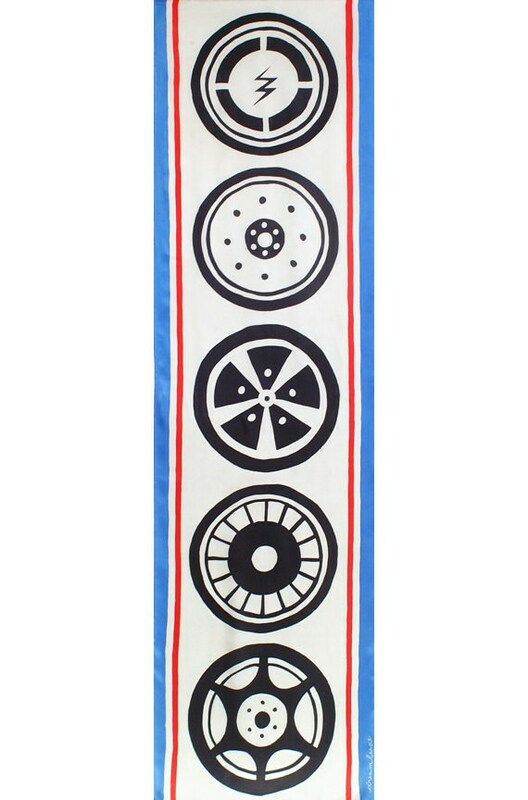 Five classic racing wheels with red and blue racing stripes.This soft handpainted silk scarf is perfect for the a sports car, racing car or motorcycle enthusiast. The scarf has five different classic racing wheels with red and blue racing stripes. This is a great scarf on those days out with the top down on your convertible or on your motorcycle with the scarf trailing behind you as you speed down the coast or city. Italian style! The is a perfect gift for a friend, girlfriend, wife, man or women!